Experience the Amazon cruising past its bountiful sceneries on South America's premier luxury small yacht river cruise. Enjoy experiences like kayaking on the Amazon, Piranha sports fishing, a Rainforest Canopy Walk or visiting a rescue Rehabilitation Center of the river mammals. Take full advantage of your time in Peru by visiting Lima, South America's top culinary destination, and highlights of the Incan empire in Cusco, Sacred Valley and Machu Picchu. Welcome to Lima, Peru! Upon arrival, your transfer will be waiting to take you to your hotel. This afternoon enjoy a culinary treat, learning to cook Peruvian dishes. Visit one of Lima’s symbolic markets to appreciate the amazing variety of fish, exotic fruits, and vegetables used in Peruvian food. You will be equipped with a list of products and descriptions of food you will encounter to help you enjoy this visit even more. Afterwards, watch as the chef of a well-known restaurant demonstrates how to prepare Peru’s main dishes, and you will learn how to make an exquisite typical Peruvian dish yourself. Rounding out this culinary experience is a great typical Peruvian lunch. On this day, your transfer will take you to the airport to catch your flight to Cusco. Upon arrival, descend to the Sacred Valley for a visit to the Pisac Village. Set off for the Sacred Valley of the Incas, en route to the village of Pisac. On the way, you will visit Awanakancha, a handicrafts store where you can also see the local fauna. At Pisac you will visit its colourful market and experience the enchanting essence of the Andes. After the tour, you will spend some time in the local market, interacting with the people, observing the local identity, and doing a little shopping. 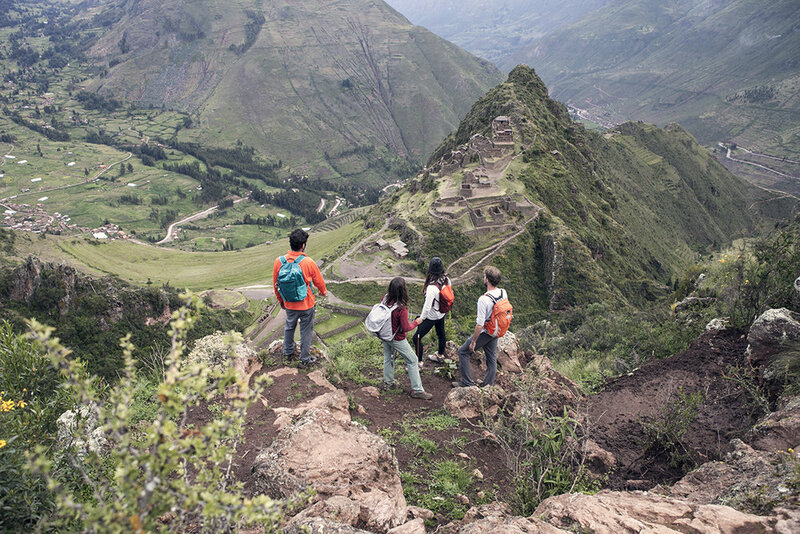 Get to know the Sacred Valley. Stop at Racchi vantage point to admire the beautiful natural scenery. Head to Moray to see the enormous circular terraces that were used by the Incas as a botanical laboratory. This is followed by the Maras salt pans, which produce the finest salt in the world, used by great international chefs. A delicious lunch will be served in a local restaurant. After lunch you will continue to Ollantaytambo, one of the most imposing building complexes of the Inca Empire and the site of one of the Spanish Conquistadors' rare strategic defeats. Famous for its terraced fields (cut into the hillsides), Ollantaytambo was an effective fortress as well as a religious centre. Finally, a visit to the village of Ollantaytambo, the only "living Inca town" and the best remaining example of Inca urban planning, with stone-paved streets that have been continuously inhabited since the 13th Century. You are going to visit one of the most important energy centers of the world: Machu Picchu. You will travel by train to the town of Aguas Calientes, an experience in which you will see the striking scenery of the Sacred Valley. Upon arrival, you will be driven to the archeological site, the visit of which will be an unforgettable experience, with a professional tour guide to impart all the history that surrounds this mysterious and enchanting place. Once the guided tour is over, you will have some free time to explore the site on your own, to relax, or to meditate. At the agreed upon hour, you will descend to Aguas Calientes for lunch and board the train later that afternoon for the return trip to Cusco. This morning after breakfast, you will fly from Cusco to Iquitos, where you will be greeted by crew members and transferred to your cruise vessel. Aboard Delfin, meet the qualified staff who will introduce you to your exquisite and cozy suite, specially equipped with all the amenities for the experienced traveler as yourself. Orthopedic beds, pure cotton sheets, pillows of 100% pure natural latex, cotton bathrobes, air conditioning, and private bathroom with Spanish style hot water showers are all framed with a spacious private terrace you will surely enjoy to the fullest. The first excursion will be done by skiff. Your first location is populated by sloths, iguanas, and recently a new favorite location for anteaters. Birdwatchers are likely to check off their bucket list, the yellow-rumped caciques and the very elegant egrets. This morning, we recommend getting up early to appreciate the wildlife. Early rising is always rewarding since animals are most abundant and active with the rising of the sun. This is one of the most important zones of the Pacaya Samiria National Reserve. The walk at Fundo Casual jungle trail will take you deep into the rainforest on terra firme (non-flooded forest) where your guide will point out the dynamic creatures and vegetation of the Amazon. Be sure to keep an attentive eye open for identifying surprises! In the afternoon, start cruising through the Yanayacu and Pucate Rivers, peeking into different creeks and lagoons. This is one of the best preserved and protected zones of the Pacaya Samiria National Reserve. Your guide will use his expert eye to pinpoint all the biodiversity of this region. You can swim in the jungle river along with the famous pink dolphins! Begin your morning with an adventurous journey to visit to a private reserve complete with 8 hanging bridges high up in the rainforest canopy. To get there, walk through the forest and paddle slowly through tranquil Tahuampa Lake, a black water lagoon with giant arapaima fishes (known locally as paiche) and with luck, you might hear them jumping up to breathe the crisp dawn air. The suspension bridges will give you a peek into the life and riches up in the treetops for many of the Amazon's animals. A symphony of sounds will surely enchant your ears. In the afternoon, continue exploring Nauta Caño Creek and its various delights via skiff. Your guide will point out animals such as the slow moving sloths, various bird species, and perhaps even squealing monkeys! If you wish, you can also kayak through the calm waters this afternoon, skimming the riverbanks on your own to play your own game of “I spy”. As night approaches, your guide will take you on a night safari in search of caiman alligators and night birds.